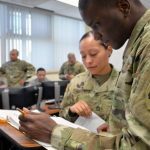 WASHINGTON (Army News Service, May 1, 2015) – While the Army does a great job of training Soldiers for the battlefield, it needs to do a better job of getting members credentialed for the civilian marketplace, Maj. Gen. Rex A. Spitler said. There are “great opportunities” for the Army in this area, said Spitler, deputy chief of staff, Army Training and Doctrine Command, also known as TRADOC. Spitler, a keynote speaker at the American Legion National Credentialing Summit here, April 28, said it is a large-scale effort for his command since 500,000 people go through TRADOC schools each year. Under such circumstances, the Army requires a highly-trained force and depends on Soldiers to be able to think innovatively and be able to survive and thrive in chaos, Spitler said. “That means in all of the training that the young Soldier receives when he comes in at the beginning of that pipeline, until he gets pushed out at retirement or anytime in between there, he is learning how to operate in chaos,” he said. That benefits Soldiers far beyond the battlefield, he said. “We’re training them how to survive and win in any environment that they’re engaged in, which also includes the civilian marketplace,” he said. The Army needs to make sure Soldiers have the best skills that benefit the Army, he said. 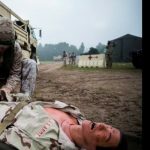 But it is also important that Soldiers can get credentialed and transfer those skills to the civilian marketplace once they leave the force, he added. “Even after 35 years of being in the military, if this is my last year, which I hope it’s not, I have to get another job,” Spitler said. People are living and working a lot longer, he said. Soldiers embody the values taught to them in the military, he said, making them great employees in the civilian world. The Army’s Soldier for Life program is an excellent example of showcasing how Soldiers serve their whole lives – from when they enter the Army, through when they re-enter the civilian world and are productive members of their community. “The work that we are doing here is not just limited to that 18-year-old, who is joining the military looking for a skill – that is also applicable to the 50-year-old, who is transitioning out of the military,” he said. It is important for the Army to make sure the message of credentialing, education and opportunities gets out in an understandable fashion, he said. “We have some work to do, especially associated with credentialing,” he said. Credentialing and readiness go hand-in-hand, said Col. Reed Hudgins, TRADOC’s director of credentialing, certification and licensing. That hand-in-hand walk begins when Soldiers enter the Army, and it continues their entire career, Hudgins told a panel discussion. “It’s a lifelong process – a life-long process that speaks to readiness for us inside the military,” he said. Credentialing saves money since the training or certification could be low or no-cost to the Army, maintains a professionalized force with industry’s best practices, and keeps members interested and challenged, he said. Since industry’s best practices make up credentialing, the skills are in demand, fresh, and viable, he noted. Credentialing is not just for the active Army, he said. “It’s applicable to the total force; without the National Guard, without the Reserve, we can’t do what it is we do,” he said. The American Legion conference brought together veterans, government officials and members of all the services for a two-day event that began April 28. The conference highlighted the importance of creating a skilled workforce that not only strengthens the military in these challenging times, but also helps the military member, said Steve Gonzalez, assistant director, veterans employment and education division at the American Legion. The two-day meeting aimed to reassess what is needed to be the “21st-century military force we need,” while also considering the military drawdown and transition of those who served the nation, Gonzalez said. Those in the military and their Families should find out now what opportunities for credentialing are available to them, so they can make the greatest use of the education, training, and opportunities, to benefit them now and down the road, he said. One of the challenges, Spitler said, is to ensure a discussion occurs not only at the individual level through word of mouth, but also from an institutional standpoint so Soldiers are aware of the opportunities the day they join. He used an example from his experience at flight school in 1981. He said not much has changed since then when he heard through word of mouth and paid out of his own pocket to be credentialed through the Federal Aviation Administration. “I think we have an opportunity here to change that,” he said.